did the grunt work for you. It is also Kid Inventors’ Day. Kids come up with the coolest stuff with imaginations not yet tethered by fear of being wrong or previous ideas clouding their ability to consider what is possible. 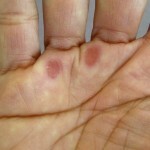 They’re not yet callous. However it is Callouses Day. There’s nothing like good, hard, callous-building work to make you feel good. Here’s my hand still feeling smiley after a nice tiring, yet rewarding, day in the garden. Another one for today that I especially like is Thesaurus Day. Who doesn’t love a thesaurus?! Well, I guess if you’re not a word loving verbavour, maybe a thesaurus doesn’t seem like something you could love. But wordsmith, that I am, I do love a thesaurus. Happy birthday to A.A. Milne (1882). He gave us Pooh and all of his friends from the Hundred Acre Woods. I loved his poem Now I am Six. I think it was the first piece of poetry I ever memorized. Remembering that just now brought a smile to my face. Surely we must live in the present, but we must also take time to enjoy fond memories. There’s a great quote of his over on a month full of Smiley Silliness. The quote made me think of Debbie Reynolds dying the day after her daughter. If only she could have died the day her daughter had the heart attack and been spared knowing that baby was dying. 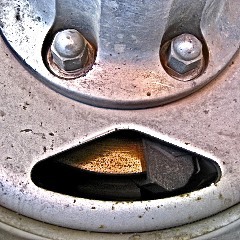 Plus, as is often the case, the Wheel Smiley you get in the Smiley-a-Day emailer is different from what you see here.